US consumer spending rose modestly in November for the fifth consecutive month, reinforcing the view of a solid if pedestrian economic recovery. Spending rose 0.4% against the previous month, the Commerce Department said, roughly in line with analysts' forecasts. Consumer incomes rose 0.3%. Consumer spending is watched closely as it accounts for about 70% of the US economy's total economic output. Separate data showed new home sales rising by 5.5% in November. Sales during the month were at an annualised rate of 290,000 homes, slightly below analysts' expectations, the Commerce Department said. 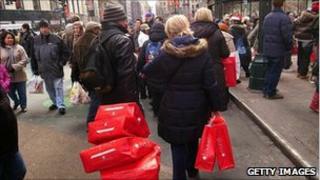 Sales were down by a fifth compared with a year earlier. The department also said that orders for so-called durable manufactured goods fell 1.3% in November. However, orders excluding transportation rose by 2.4%. The Commerce Department also revised the consumer spending figure for October, from 0.4% to 0.7%, which bodes well for the end-of-year GDP figures, it said. "Consumer spending in November and October is consistent with stronger economic growth during the fourth quarter," said the department's acting deputy secretary, Rebecca Blank. Analysts were also cheered by the figures. "The spending numbers are good for the economy, no question about it," said Joel Naroff at Naroff Economic Advisers. "Consumers are shopping until they are tired, they are not shopping until they drop." Figures released on Wednesday showed that the US economy grew by an annualised rate of 2.6% between July and September, slightly up on the previous estimate of 2.5%. However, doubts remain about the strength of the recovery. Earlier this month, the US Federal Reserve said the recovery was still too slow to bring down the country's high level of unemployment. Figures released earlier this month showed the unemployment rate rising to 9.8%, its highest rate since April. This is why the Fed has announced that it will pump $600bn (£390bn) into the economy, and why the government has extended tax cuts enacted by President George W Bush that were set to expire this year.